Pumpkin spice coffee, sweaters, brisk weather, and your festival. Capture the season and attention with the Fall Leaves Image Flyer. 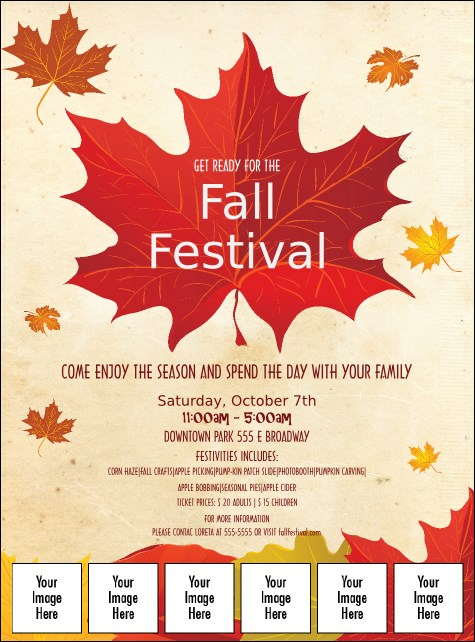 Brightly colored leaves drift into a pile within this template’s background, while event details are presented in warm typeface. Fill its six image upload spots with sponsor logos! Sized at 8.49" x 11.46"
Generate interest for your event with custom printed flyers from TicketPrinting.com.